Double or multi yolk eggs whilst very enjoyable are actually a fault. They are common in young, laying hens, especially from hens that are from highly productive strains. A double yolk egg is formed when two ovulations take place almost at the same time and go down the oviduct together and both get encased in shell. Double yolks in eggs (also know as double yolkers) are in fact quite rare but if you like the yolk, more than the white in eggs then it’s a rather nice surprise when you open it to find you have two or more yolks! 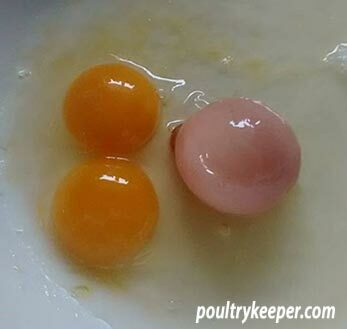 Poultry genetics says there should only be one yolk per egg. There would be insufficient space for two chicks to develop inside a shell and the breed would effectively die out. As the hen matures, she will normally only lay single yolk eggs. Double yolk eggs are in fact a fault that occurs when two or more yolks are released inside the ovary at the same time, causing them to be wrapped in albumen (white) and then an outer shell. It isn’t possible to find breeds of hen that will consistently lay double yolkers unfortunately although some shops will sell double yolk eggs where these have been selected when they are candled for blood spots and other problems at the packing station since a premium price can be charged for these. 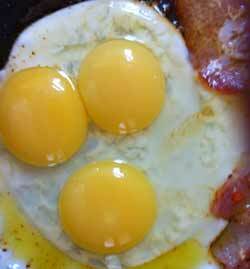 Double or triple yolk eggs are usually found in young pullets around 20 to 28 weeks old. The probability of finding a multi-yolk egg is estimated (by the British Egg Information Service) at 1 in 1000 overall but that drops to 1 in 100 for these young pullets. Since commercial farms have flocks of the same age hens, you may just be lucky enough to get several double yolk eggs in the same box… but that’s pretty rare! Even more rare is an egg with more than 2 yolks. Triple yolkers occur from time to time and in fact, it’s possible to get more yolks in an egg. The most yolks ever found in an egg was 11. Imagine that! The most unusual egg I’ve seen so far was from Sheryl Harris in Grawn, Michigan. Sheryl cracked open a giant-sized chicken egg from a young Isa Red hen and to her surprise found a double yolk, plus another small, egg inside (see photo, right). When she cracked open that egg, it was fully formed; there was another yolk inside. I can only imagine that the hen was young and laid a smaller egg which somehow got stuck after being shelled in the normal way. The next two yolks would have come down from the ovaries together and the whole lot would have been shelled, creating one large egg. Summer 2015 and I’m updating this page. I’m hoping to start a gallery of multi-yolk eggs! It was suggested we should have a bit of a ‘shrine’ for these eggs since people love them so much! Please can you send us a photo of your multi-yolk egg ([email protected]) so we can show it here in a gallery! Please include your name and nearest town & country. Lorien in Illinois opened these two triple yolks one after the other. Karen Florentine arrived on this page after opening 4 double yolks in a row! Nathan Hunter took this picture of 8 Double Yolk Eggs in a row! Jeff, North of Montrose PA has 13 girls just starting to lay and cracked this egg open to find this triple yolk. Triple Yolker from a New Hampshire Red hen owned by Stephanie Parker, Candor NY. 4 double yolkers for breakfast. Andrea Way, Umina Beach, New South Wales. Mariah Srygler’s six month old white Pekin duck laid this triple yolker! Sara Martinson from Rio, WI USA found this double yolker. Irene Moore bought some eggs in the reduced aisle of Tesco, East Kilbride, South lanarkshire, Scotland and found these two double yolkers. Two double yolk eggs. James and Imogen Halstead. Sydney, Australia. 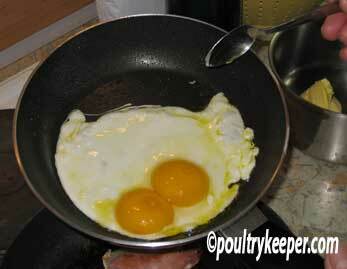 For Double Yolk Eggs from Christine near Hemel Hempstead. Christina Brady from downtown Denver, Colorado had this Double Yolk Egg. Feng Ling was travelling New Zealand and found this triple yolk egg in a size 8 egg. Rachael Bowie from Bedfordshire, UK found this Double Yolk Egg. Jefferey Claridge had 22 yolks from 12 eggs! 5 yolks in this egg opened by Caitlin in California, USA. Triple Yolk Egg found by Nicole Hendee in Carson City NV. 4 Double Yolks found by Fiona Requadt. Triple Yolk Egg laid by a bluebell pullet that weighed 88g. Sent in by Adrienne Barker in Stroud, Glocestershire.